The century old Hertwig’s rule in doubt: is the long cell axis rule valid in tissues? This interesting preprint silently challenges the century old Hertwig’s rule. Hertwig’s rule predicts that an elongated cell divides along its long cell axis, resulting with two daughter cells aligned along this long axis. This rule, named after its discoverer german zoologist Oscar Hertwig, has been observed in frog eggs. When Hertwig mechanically squeezed normally round frog eggs to create an elongated shape, they divided along this newly established long axis. Based on this finding, the ‘long axis rule’ was born and published in 1884 1. Although this rule has been supported in animal and plant tissues since then, it took almost a century to address how this is actually done by cells in tissues. Firstly in 2016, the ‘tricellular junction mechanism’ was discovered, which shows how cells remember their interphase topology during their division 2. Surprisingly, the authors of this highlight claim that they have found an exception of the Hertwig’s rule. They identified a cell population in the epidermis of segmenting Drosophila embryos, which does not precisely divide along the long axis. Importantly, they find that it is the mechanical tension/stress in close vicinity to a cell that directs the cell spindle and thereby the direction of subsequent cell division. How the authors came to this conclusion? 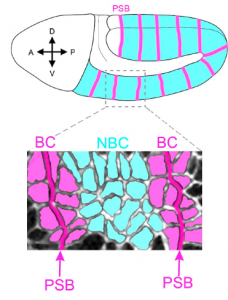 During segmentation of the Drosophila embryo, actomyosin contractile cables are enriched at the compartmental boundaries and define individual embryonic parasegments. Using this, the authors could distinguish between epidermal cells (BCs) directly placed next to the parasegment boundary and non-boundary cells (NBCs) that are well away from these supracellular contractile cables. Interestingly, the authors have found that unlike NBCs, the BCs often ignore Hertwig’s rule, i.e. they do not necessarily divide along their interphase long axis. 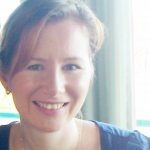 To investigate the cause, they performed elegant genetic, pharmacological and physical perturbations of actomyosin contractile cables and found that the tension exerted by neighboring actomyosin cables influences the direction of cell division at parasegment boundaries via a centrosome capture mechanism. This preprint provides persuasive evidence that the tension exerted by actomyosin contractility influences the orientation at which the cell positions its spindle and in what direction it will eventually divide. In other words, the authors has discovered that local mechanical stress applied to cells in tissues defines the direction of cell division in proliferating animal tissues. I love all the cartoons and plots, which are very persuasive, but I am puzzled as to how the authors defined BCs and NBCs. I cannot honestly identify these actomyosin cables in the provided example images where MRLC-GFP marker is used. For example, in Fig. 2a with MRLC-mCherry, I wonder what is the exact definition of a parasegment. On a similar note, a conclusive image of an ectopically generated cable expressing Wg with a subsequent cell division of the neighboring cell along its short axis appears to be missing. Perhaps, will this be provided as a movie? I am somewhat concerned about the mathematics behind Fig.1j. Although the authors claim that BCs are more compact than NBCs, the example pictures for NBCs and BCs actually show a similar shape with a log10 ratio of ~0.3 for both. This is also true in other figures. 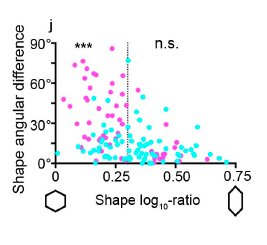 In addition, I wonder what NBCs with a log10 ratio of ~0.6 actually look like and whether this shape truly reflects reality in the epidermis. In the picture showing a whole embryo, I cannot see such extremely stretched cells. I am puzzled why the Hertwig’s rule is interpreted in this preprint that a cell will divide in the direction of the long axis of the interphase cell? I understand that Hertwig’s rule is based on observations of frog eggs. However, the majority of animal eggs (frog eggs are no exception) are in meiotic metaphase II arrest. Based on the experiments of O. Hertwig, I rather understand that the correct predictor relates to local tension exerted on the cell at the time of cell division and must not exclusively depend on the interphase cell shape in a tissue. If true, this preprint may actually support the Hertwig’s rule by showing that actomyosin contractile cables, exerting local mechanical stress on cells, can re-/orient and define the direction of cell division. Interestingly enough, the authors provide nice physical manipulations during metaphase and anaphase, which supports this. It makes me subsequently wonder whether there is a difference in mechanical stress/tension at the dorsoventral and anterior-posterior cell bonds of BCs? How does this look in comparison to NBCs? What if the more compact shape of BCs is the result of a counter-force generated by the actomyosin cables that compete against cell stretching (80%) along the DV axis of the embryo? How does the identification of more compact BCs affect the rule that cells at the compartmental boundaries do not mix? Could their compacter shape and misoriented divisions be linked to it and eliminate cell intermingling? What I like about this work and why I have chosen it? This preprint caught my eye as the authors interpret their data as inconsistent with the century-old Hertwig’s rule. Scientific dogmas are often a challenge to rewrite and so I admire the authors to challenge this Hertwigs’rule. Interestingly, this preprint shows that the tricellular junction rule does not serve as a good readout to predict the direction of cell divisions in the epidermis of the Drosophila embryo, unlike in the Drosophila notum 2 . Therefore, it still remains elusive what common mechanism (if any) predicts the direction of cell division in tissues and actively sculps tissue architecture in animal bodies. Hertwig, O. (1884) Das Problem der Befruchtung und der Isotropie des Eies, eine Theory der Vererbung. Jenaische Zeitschrift fuer Naturwissenschaft. Bosveld et al. (2016) Epithelial tricellular junctions act as interphase cell shape sensors to orient mitosis. Nature 530, 495-498.